Speaking in strictly financial terms, investing in your physician relationships at a strategic level can pay off. Physicians have been called the “economic engines” of healthcare — and with good reason. According to a 2019 Physician Inpatient/Outpatient Revenue Survey, the average net revenue generated by all physicians is $2,378,727 per year, up from $1,560,688 when it was last surveyed in 2016, an increase of 52%. This includes both net inpatient and outpatient revenue derived from hospital admissions, tests, treatments, prescriptions, and procedures performed or ordered by physicians. So, if for no other reason than your bottom line, it’s important to develop a growth strategy that keeps physicians front and center. A “bottom-up focus,” where the input of physicians informs and drives your strategic plan, can be a smart way to engage them. It will also keep your hospital in tune with and aware of the concerns that are top-of-mind for your physicians, and your strategic plan will be more likely to include elements that support their work and interests. This method gets physicians involved in strategy through inclusion in planning sessions and feedback. Rather than have a strategy created by top leadership at your hospital, this approach leans more heavily on the physicians for input. Physicians feel engaged, heard, and accountable for the outcome. "There's not a physician that I've come across who doesn't want to be involved in planning. Physicians have historically felt removed from the decisions that affect the practice of medicine. When they lose decision-making, that leads to despair," Steven Sheris, MD, president of the 900-physician AHS Medical Group. 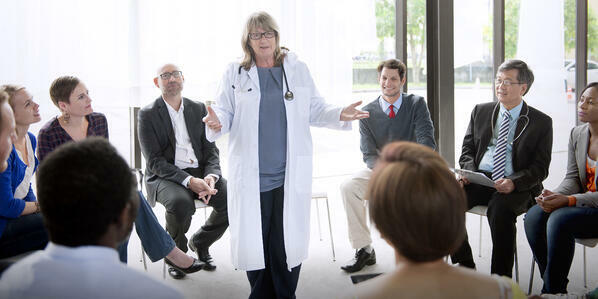 Physicians want to be more involved, and this way of planning gives them the opportunity. Working directly with physicians and allowing them to speak into your strategic growth process every step of the way — and involving them in creating the metrics that will determine success — is a sure way to enlist their loyalty to your hospital. An American Medical Association (AMA) survey shows that approximately a third of physicians are employed directly by hospitals or by practices either owned wholly or in part by hospitals. Creating “economic docking opportunities” with physicians, as described by Dan Varga, M.D., chief clinical officer of Texas Health Resources, either through direct employment, joint ventures, or the use of clinical integration organizations, will financially sustain physician loyalty to your system. You can also engage physicians during your strategic planning process as budgets are being discussed. Tie your growth plans to your budget over a several-year period, where adherence is reviewed and adjusted regularly. Allow physicians and other direct caregivers to handle the specifics of how to achieve growth and quality goals directly tied to the budget goals. This will provide an opportunity for physicians to feel ownership in budgeting decisions and in the execution strategy needed to meet these financial goals. A hospital’s success is dependent upon not only having physician support but having the right mix of physician support. It’s critical to have a plan that will address the needs for both the right number and the right mix of physicians to grow service lines where expansion is needed and to add new service lines where needed services do not already exist. Information about how to address these physician needs can be found in this post: 6 Steps to Conducting an Effective Physician Needs Analysis. Your Medical Staff Development plan can also incorporate physician surveys, which can highlight market needs and allow you to better understand the market from a physician’s perspective. You can uncover details such as what age they plan on retiring and what services not currently being offered are needed to support the market. Incorporating these insights, which are of high importance to your physicians, into your strategic plan will show that you are keeping their needs a top priority. This is a key point of concern in our current state where physician burnout is prevalent and costly. Medscape’s annual Physician Lifestyle Report surveyed more than 15,000 physicians from 29 specialties. Of survey respondents, 42% of physicians reported burnout. Physician relationships with hospitals are one of the major factors contributing to burnout and the cost of physician burnout can range from $500,000 to more than $1 million per doctor. Taking your physician’s needs to heart and involving them in your process can improve physician sentiments towards their hospital partners and encourage them in their day-to-day operations, potentially lessening their feelings of burnout. Growth can be achieved by focusing on your physicians and involving them in your strategic growth strategy. Any of the tactics suggested above can help you more effectively keep your physicians front and center. Stratasan offers a number of tools which can support the physician outreach and tracking necessary to employ a bottom-up focus, institute economic integration, and incorporate your Medical Staff Development plan into your strategic growth strategy. Through referrals: where are physicians sending or receiving patients? Through understanding where physicians are actually performing procedures. While data availability varies throughout the country, some states offer physician detail in their state data offerings. When that is the case, Stratasan’s Physician Loyalty tool can be used to illuminate and show exactly where physicians are doing their work. Particularly in competitive markets, knowing where physicians are splitting equips business development teams to have more direct conversations with their physicians. Physician Loyalty shows physician volume by facility, by payer, and by product line across time. Stratasan’s Strategic Advisory Services are the perfect compliment to hospitals looking to grow. Our team of experts can assist with everything from facilitating a one-off strategy session to conducting a physician needs analysis, medical staff development planning, or facilitating physician focus groups and surveys. Our team provides the data, insights, and strategic growth expertise that can empower your team to evaluate your market with a new perspective. For more information about how Stratasan can help you develop a physician-focused strategic growth strategy schedule a discovery call with one of our experts today.